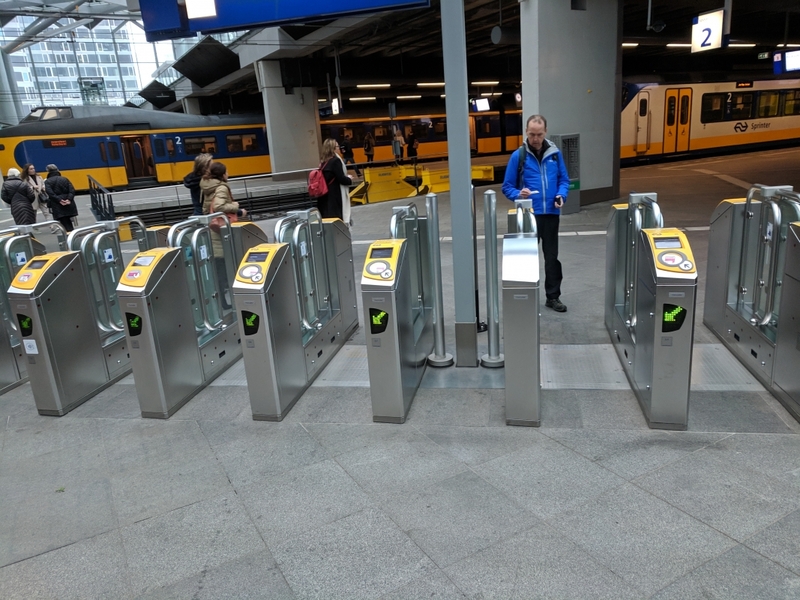 The Dutch have created a system of transportation infrastructure which allows people to travel all over the country without the use of a personal motor vehicle. All routes provide safe travel via car, bike, and foot. Long trips are made possible with the extensive train system, and trips within cities are convenient thanks to subway and light rail lines. Two of the most important aspects of Dutch roadway design are speed and separation. Drivers are forced to travel slowly because of curves, obstacles, and elevation changes in their path. Street parking can be moved from side to side, speed bumps and crossing tables can reduce speed, and horizontal roadway alignments can be altered to enforce speed limits. When speeds are around 20 kilometers per hour or lower, cyclists can safely share the same travel lanes as drivers, and in some cases, pedestrians can also safely share the road. “Fietstraats” are roads designed primarily for cyclists, with signs showing that cars are allowed as guests. They travel at bike speeds and give priority to cyclists. When travel speeds are higher, the Dutch do a great job of separating cyclists and pedestrians from cars. Cycle tracks are often at a different grade than the car lanes or pedestrian areas and are typically colored red to signal that they are designated for bikes. Dutch design differences from U.S.
American drivers like to go fast, and they typically do not like to slow down for cyclists. American roads have much higher speeds, sometimes with bike lanes on roads with 50 mile per hour speed limits. There is also a concentration of bicycle infrastructure in cities rather than American suburbs and small towns. Biking from Delft to Maeslantkering was eye opening because it showed that bicycle infrastructure does not end at city limits. Separated bike paths allowed us to travel safely for 12 miles past farm fields, small neighborhoods, and greenhouses. Cyclists are always accounted for on Dutch roads, whereas in America they are only beginning to be accounted for in cities. A lot of American cycling infrastructure is still designed to keep cyclists visible by keeping them next to cars, rather than separating modes based on speed and providing safety for cyclists. There are very few spots along bike routes in the Netherlands where I felt in danger of colliding with a high-speed vehicle. Americans need to recognize the importance of separation for bikes before average people will feel safe cycling for routine trips. The Dutch are environmentally friendly out of necessity. Most of the Netherlands is below sea level, and so they understand the threat of climate change and sea level rise. The Dutch recognized when cars caused too much pollution and too many traffic deaths. They protested for change in transportation, and the government responded well. They have dedicated money to creating, renovating, and maintaining bicycle infrastructure all over the country. Funding comes from national and local levels. Drivers understand the importance of cyclists because many of them ride bikes as well. Dutch drivers and patient and aware because they treat driving as a primary activity, not as a time to get other things done. Over the past six days, we have been all over Holland. 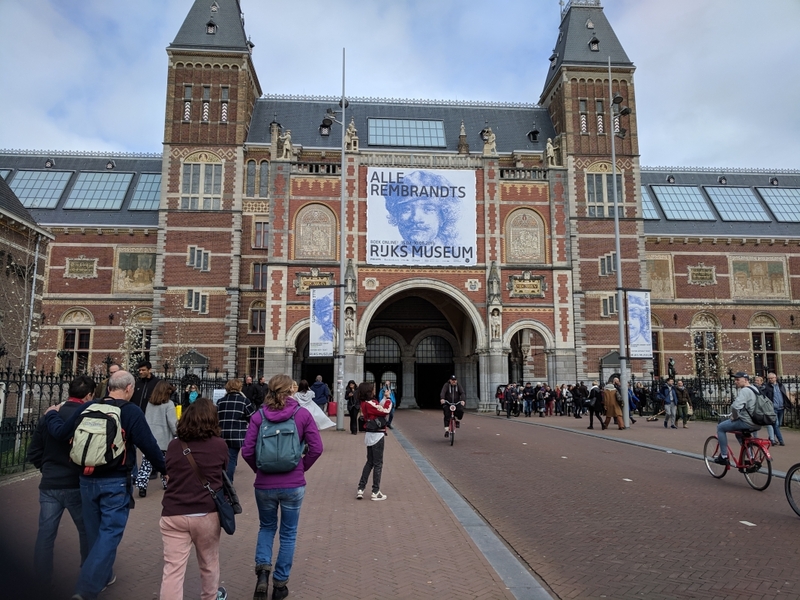 We landed by plane in Amsterdam, took a train to Delft, walked and biked around there, took trains and trams to other cities, and eventually took more public transit back to Amsterdam. We never had any need for cars, as we biked and walked for short trips and seamlessly connected to public transit for longer distances. Every train station we have been to has extensive bicycle parking, which is typically free for up to two weeks. 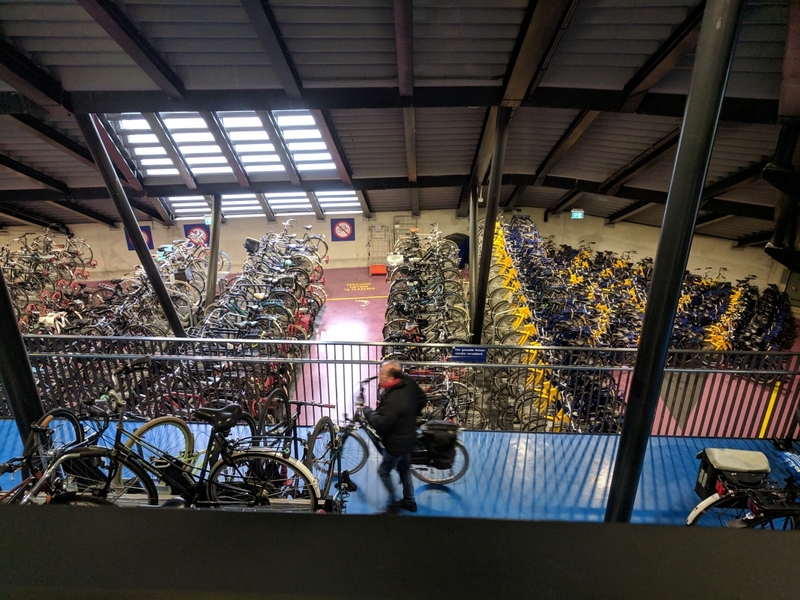 The bike parking at Delft station has two levels, with racks above that swing down for easy storage. At times, especially on weekends when college students take the train home, the parking facilities fill up to capacity. During these times, some of us had to park our bikes in designated space behind the racks. Even then, it was relatively easy to secure a bicycle and enter the train station directly. 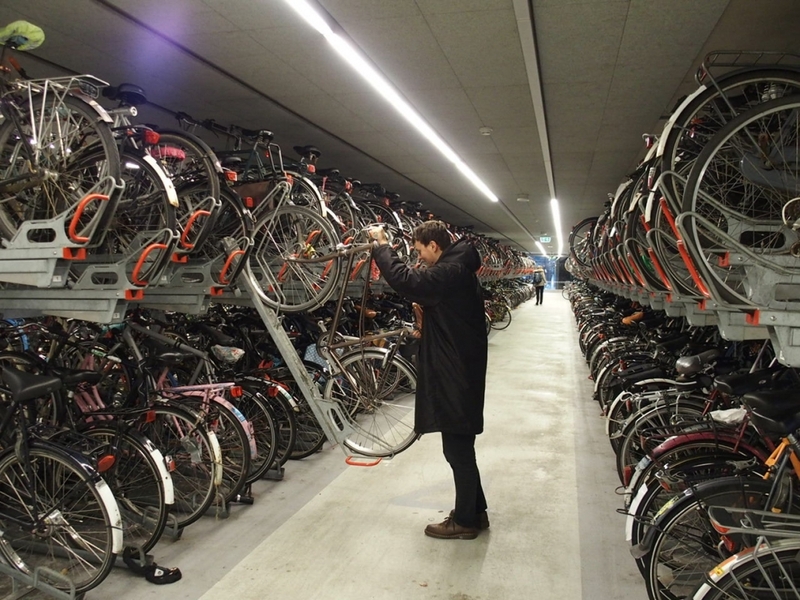 Bicycle parking facilities are often indoors, have some form of security, and have rental and repair shops on site. This makes biking a convenient way to get to and from stations for residents and visitors. Ramps allow cyclists to ride directly into the parking facility, and train stations are typically connected to the bike parking. 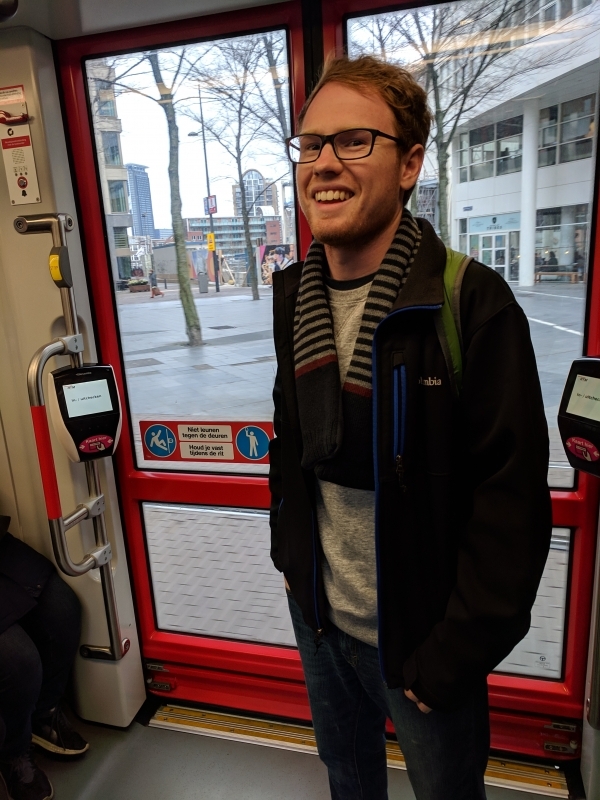 Tram and metro are not quite as reliable for bike parking, but they connect easily with intercity trains. Taking bikes on trains is allowed for a small fee except during rush hour, but most riders choose to leave them at the station. There is often very little space for bikes, and most prefer to rent or have a second bike in their destination city. The OV chip card gives access to all trains, trams, subways, and “OV fiets” bike rental facilities. This all-inclusive card makes using public transit much more convenient and would be a great step forward for Atlanta with the integration of transit in multiple counties. The Dutch measure transit performance based on total use and travel times, as well as other technical statistics. 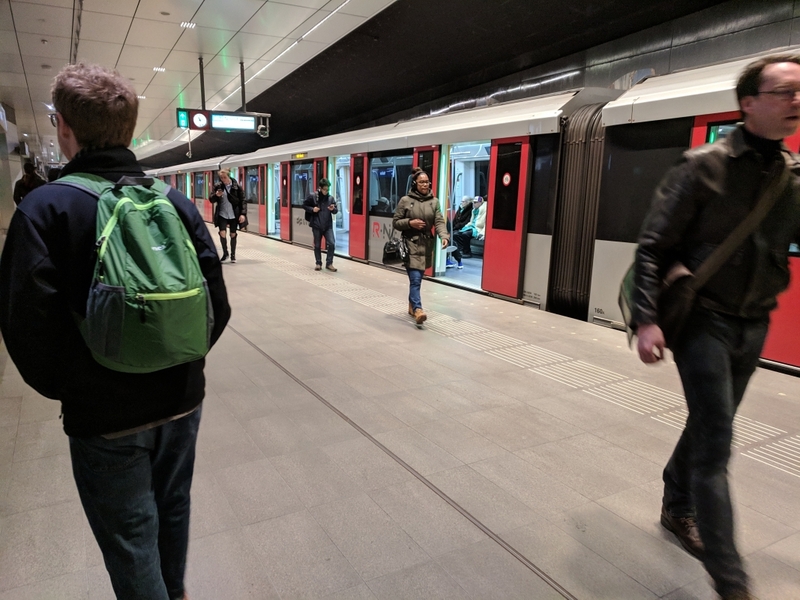 When the municipality of Amsterdam spent over 3 billion euros to build a north-south metro line, they noted the reduction in travel time from 30 to 15 minutes, and about 100,000 daily trips. They also measure the level of accuracy for arrival and departure times, as punctuality is important in Dutch culture. There was a lot of pushback from residents before and during construction of the metro line because of delays and costs, but residents have not hesitated to use the new system to cut times on their trips. Video boards are impossible to miss in Dutch transit stations. Train lines show departure time, all stops, and track numbers. Tram and metro stops have similar signs, with line number and destination stop so that riders know where they are headed. Maps are shown in stations and on cars, with some even having lights for upcoming stops. The public transit has been very timely, and we have not had to wait long at any stops. The Amsterdam tram goes 15 times per hour so that no rider should wait more than 4 minutes. 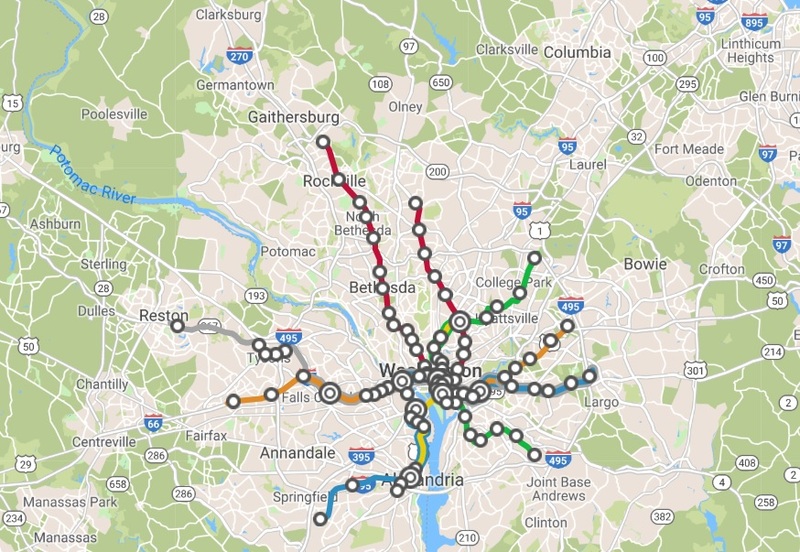 This focus on frequency and prompt arrival is consistent throughout the transit system, and all routes account for traffic and sharing of tracks. 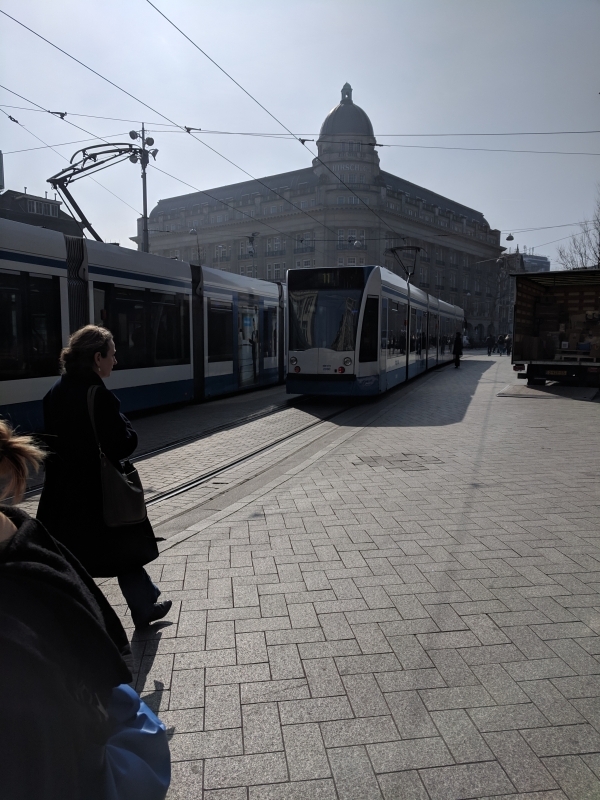 The light rail system in Amsterdam has spots when one tram has to wait for another but queuing and passing is consistent and fair to keep all lines on schedule. 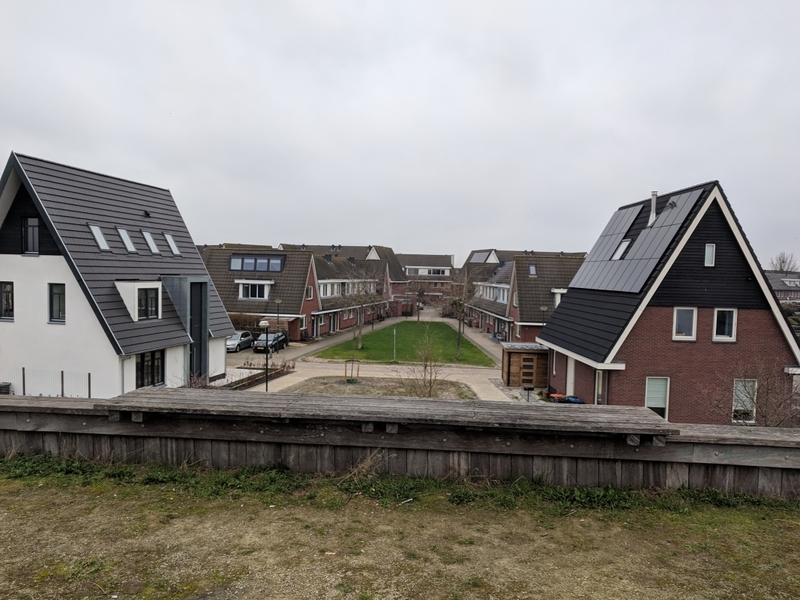 Houten is an idealistic city created in an almost perfect circumstance. The ring road around the perimeter encloses a town full of happy children, safe streets, and proud residents. 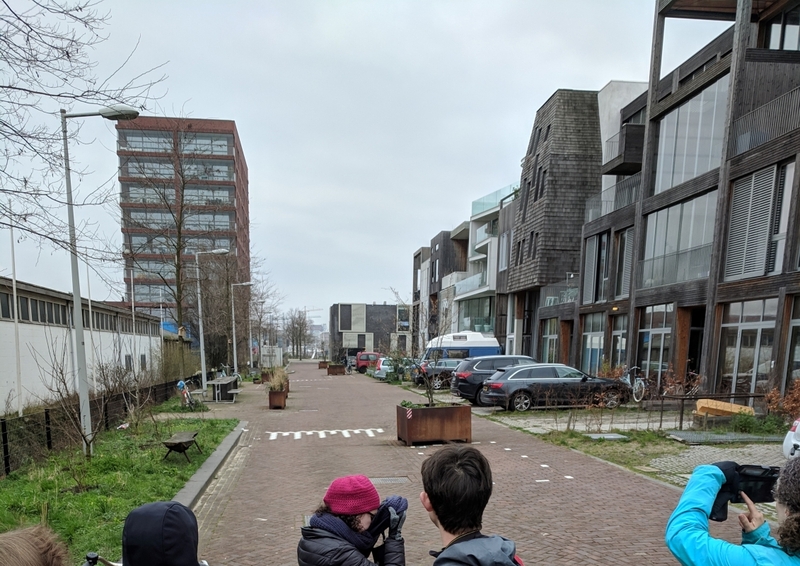 Andre Botermans, a city planner who works and lives in Houten, gleamed about the town's achievements and accolades for their system of cycling infrastructure. Most routes within the ring are free from vehicular traffic, and so cyclists and pedestrians can safely travel without having to stop and yield to cars. Children can bike to and from their schools, and to any of the plentiful playgrounds. The city is centered around two "hearts", which are both located at train stations. It takes less than 20 minutes to bike from any house in town to the train stations, and from there it is only a 10-minute ride to the thriving metropolis of Utrecht. Two thirds of people in the Hague work elsewhere, so it is important to connect biking and walking with public transit. Trains go from Houten to Utrecht and Rotterdam, and buses go around Utrecht to other cities in the area. Some of the most interesting features of the bike network are the two-level roundabout, the bicycle bridge over the water, and the dual city hearts. These features, along with many others, earned Houten the "cycling City of the Netherlands" in 2008 and 2018. The overall planning of the town makes cycling a very appealing option for residents. Bikes are allowed on all the paths, which provide direct routes between neighborhoods and other destinations within the town. Car parking is also typically about 100 meters from houses, which encourages cycling or walking to close destinations. Planners also prioritized greenery and water along routes, which creates lovely views as you travel within Houten. I think small towns in the U.S. could create a similar system for cycling, but they need to have connections via transit for longer trips. Near my hometown of Germantown, MD, the DC metro stops in many suburbs. There is new funding and a biking master plan for Montgomery county, and some suburban areas are already designed with housing, schools, offices, and shops within a three-mile radius. If cars were rerouted around these communities, the existing arterial roads could be converted to bike paths. From an infrastructural point of view the transition would be reasonable, but there would have to be an acceptance of the cultural shift from all residents in the community. Most Americans value the convenience of driving, and they would be reluctant to change their daily travel modes. This idea could be better suited for new developments with a focus on young professionals. 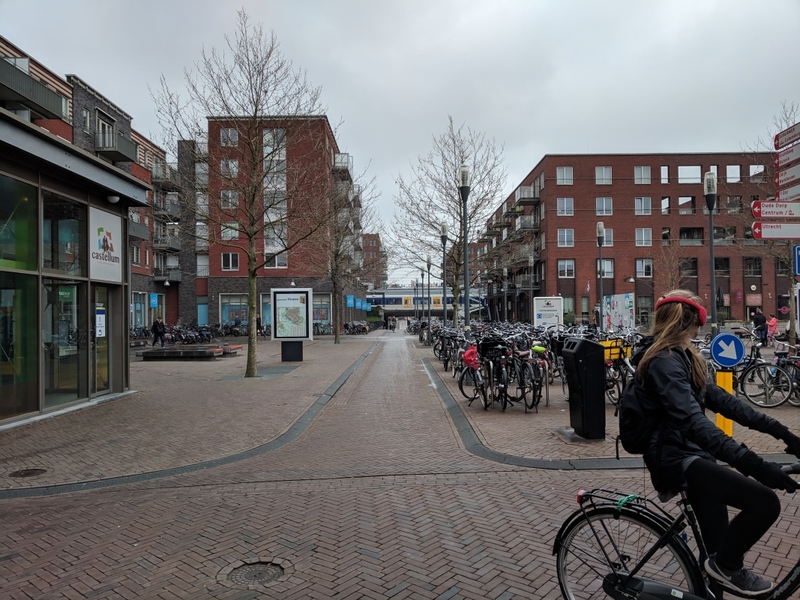 With enough resources and willing inhabitants within the ring road, the Houten model for cycling could be effective in American towns. The differences between cycling in the Netherlands versus the U.S. were clear immediately when we arrived in Delft. Even on the train from Amsterdam, the rural roads we passed all had bike infrastructure, whereas rural bike infrastructure in America is difficult to find. Dutch engineers and planners account for cyclists and pedestrians on every route. Cycling around Delft and to Maeslantering was a bit nerve-wracking at times, but only because I was new to the system and did not have a firm handle on traffic laws. Dutch cyclists all seem to be on the same page when it comes to yielding, intersections, and passing. American cyclists, even with experience, must often stop and read situations before proceeding. After two days, I have a better understanding of where I should be as a cyclist versus as a pedestrian, who I need to yield to and who will yield to me, and how to interact with other travelers. Even at the beginning when I was confused, I still felt safer than I did cycling around Atlanta. Cars generally travel at low speeds, and when they go fast, they are separated from cyclists and pedestrians. If I had been in an accident, I firmly believe that my injuries would be minor or nonexistent. 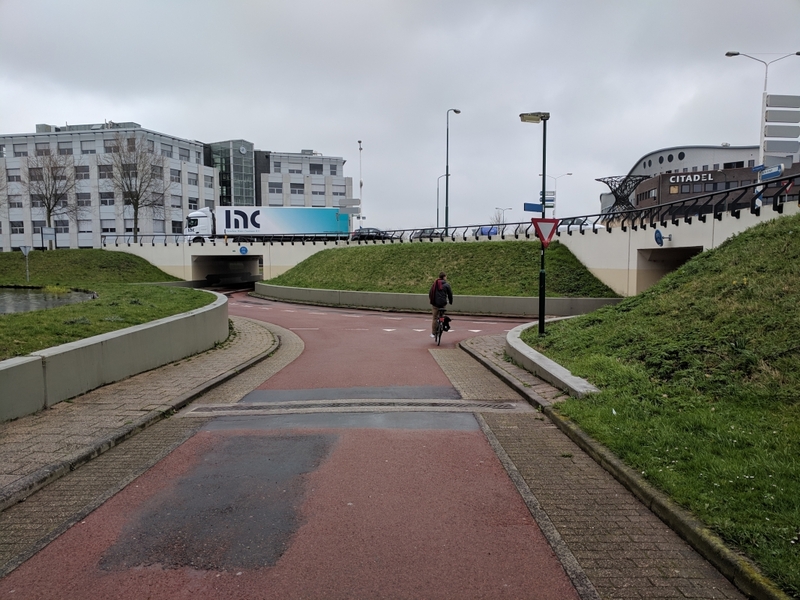 The Dutch system of cycling infrastructure is a bit overwhelming and does not feel entirely feasible for Atlanta and many other American cities, but there are many concepts that could be applied. I particularly liked the raised crossings on two-way cycle tracks and the “woonerf” neighborhood streets. The crossing table seemed like a simple solution for the visibility of cyclists at small intersections. As shown in the diagram, the crossing table allows cyclists and pedestrians to continue easily at the same elevation, while cars are forced to slow down to get over the bump. This is a simple way to slow down motor traffic and give drivers more time to notice cyclists and pedestrians. The “Woonerf” was a delightful way to allow cyclists and cars to interact with people using the street for recreation. Cars go at the same speed as pedestrians, so there is a very low risk of collisions. Alternating sides for street parking and tree planting naturally enforces speed limits. I think this could be an ideal solution for Harden street in Atlanta, due to its low car traffic, family housing, and proximity to high traffic bike routes. Dutch drivers expect to interact with cyclists on the roads, and so they look for them at intersections and are always prepared to yield when they should. Arrows point towards the traveler who is supposed to yield, and so the responsibility is shared by different modes at different intersections. Many crossings give priority to cyclists, which is a very rare occurrence in the U.S. I can honestly say that as a confused American cyclist over the past two days, I have annoyed more Dutch cyclists than Dutch drivers. Cyclists seem to own the roads in the Netherlands, and drivers understand that they must go slow, watch their surroundings, and give priority to more vulnerable travelers. The readings presented a lot of ideas that were logical, and a few that made me double check the statistics. Cycling has been growing in most major cities since the turn of the century, but the Netherlands is on another level from the U.S. in terms of spending, use, and knowledge. 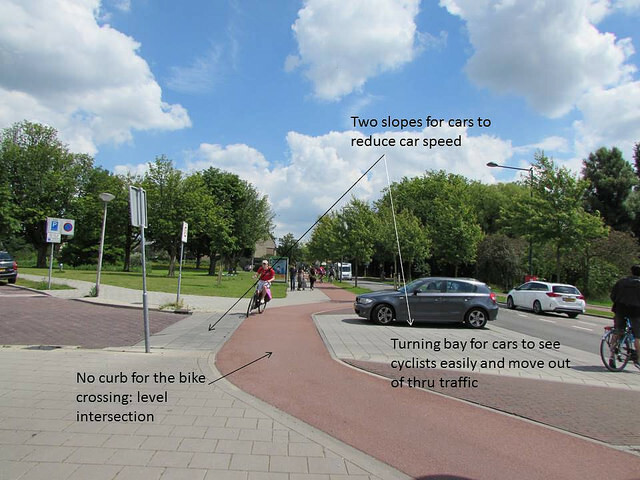 The Dutch have figured out the most effective ways to balance motor traffic with cyclists and pedestrians, keep everyone safe, and incentive sustainable transportation. Americans are beginning to recognize the environmental and health benefits of cycling, but there is a long way to go before it is reasonably safe for all cyclists. I was particularly surprised by the discussion of helmets in the safety chapter of City Cycling. Helmets have always been praised in the U.S. for making cycling safe, but safety really depends on infrastructure and separation from vehicles. Helmets are often used to compensate for a lack of cycling skill and people are more likely to take safety risks when wearing them. Laws enforcing helmet use do more to reduce cycling than reduce head injuries, which ultimately makes cycling less safe (Pucher 2012). I will continue to wear a helmet when cycling in the U.S., but I am looking forward to cycling without one in the Netherlands and feeling the difference. Differences Between Netherlands and U.S.
John Forester’s vehicular cycling policy has set back American cycling infrastructure as the Dutch have excelled and developed. Forester convinced Americans that cyclists are most safe when they act as and are treated as vehicles because that is how drivers notice them (Pucher 2012). The Netherlands has proven the opposite, with greater safety for cyclists when they are separated from cars, especially at high speeds. The Dutch separate cyclists from cars on any road above 20 mph, and they have the highest use and lowest injury rates of any country in the world (Pucher 2012). 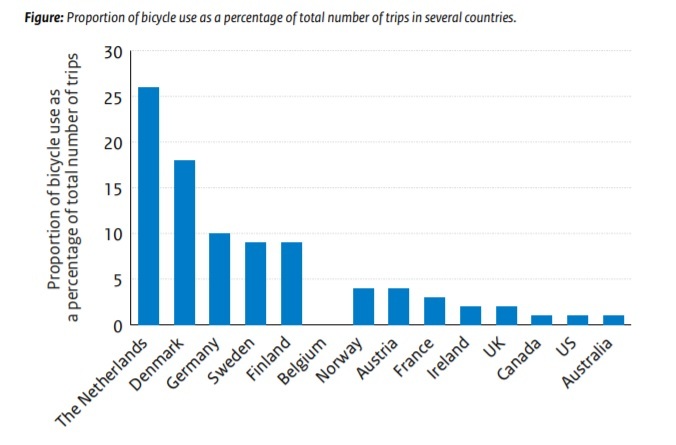 The figure below shows the percentage of trips taken by bicycle for several countries, and the Netherlands leads the pack by a comfortable margin (Harms 2018). The American Association of State Highway and Transportation Officials (AASHTO), still does not endorse or aid in the design of separated bike paths. Some U.S. cities have taken advice from the Dutch, and incorporated cycle tracks and separated paths into their biking networks. The National Association of City Transportation Officials (NACTO) has released an Urban Bikeway Design Manual with specific guidance for U.S. cities attempting to design Dutch-style cycle infrastructure (Pucher 2012). There are also striking differences in bicycle-related policy between the United States and the Netherlands. 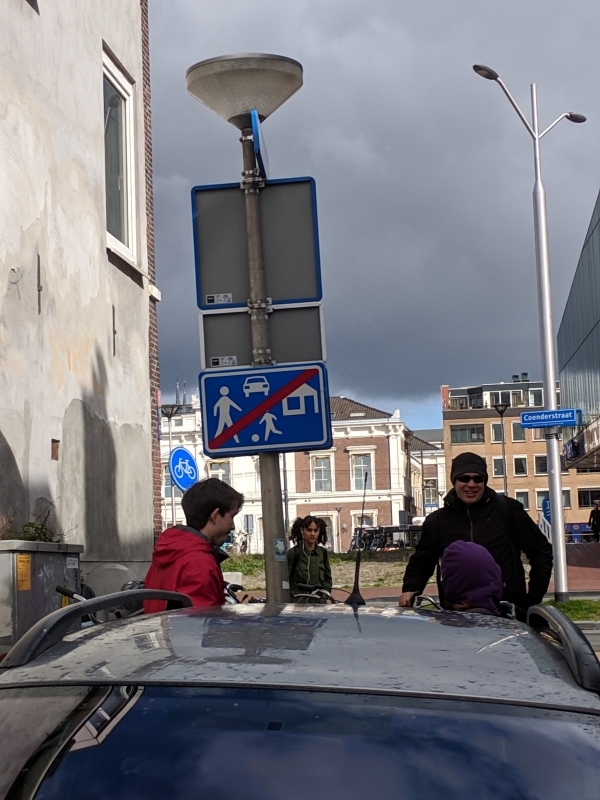 Schools in the Netherlands provide safe cycling training for children so that they know how to interact with other travelers and interpret road signs. Dutch driver education also covers interactions with cyclists and pedestrians and makes vulnerable modes of travel a priority. Such programs in the U.S. focus only on the drivers and their safety in relation to other drivers. The Netherlands also has laws that make drivers responsible for all collisions with children and elderly cyclists (Pucher 2012). People of all ages and abilities ride bikes in the Netherlands because of their safe systems, as opposed to the U.S. where most cyclists are fit adult males. Government spending on cycling is also much higher in the Netherlands. Portland, one of the most pro-cycling cities in America, spends about 10 times less per resident per year than Amsterdam (Pucher 2012). The Dutch have created a beautiful model for how cycling can help a country. A switch from cars to bikes decreases air and noise pollution, makes people healthier, and costs less for infrastructure than cars. American cities are beginning to recognize the importance of cycling and incorporate Dutch systems into new infrastructure projects, but many areas of the country still have poor or no cycling systems. There will need to be a cultural shift, a dedication to funding, and most importantly an acceptance of Dutch methods in the United States. Many Americans will likely retaliate against increased taxes on drivers, reduced travel speeds, and more space dedicated to cycling, but it is important to consider the greater good and the long-term benefits of increased cycling. If the U.S. dedicates time and money to cycling, they could slowly approach Dutch levels of sustainability in transportation. Harms, L., & Kansen, M. (2018, April). Cycling Facts: Netherlands Institute for Transport Policy Analysis. Summary National Policy Strategy for Infrastructure and Spatial Planning. (2011). Ministry of Infrastructure and the Environment. Finding mentors is an important step in advancing your education or career. An effective mentor can prepare you to achieve your goals, as ideally, they have already achieved similar ones. A good mentor also provides feedback and encouragement throughout your time working together. When choosing mentors, it is important to consider what they have experienced as well as what they are currently doing. If your mentor is involved with work that interests you or organizations you would like to join, they can likely put you in touch with other mentors or professional contacts. It is important to be proactive and direct when reaching out to mentors. You should communicate early on what you expect from the relationship and how they can help you the most. You also need to be available, committed, and respectful of your mentor’s time. It is a good idea to find multiple mentors, as each will have unique experiences, insights, and schedules. If one mentor is unavailable when you need them, another could possibly step in and help. Once you have a mentor, make sure to set up a reasonable schedule and establish expectations for communication. If you both know what you want from the relationship, you will likely get more out of it. No matter what you gain from a mentoring relationship, it is important to show your appreciation for their time and to set up options for future contact. There are many ways to be an effective leader, but there are traits that almost all great leaders possess. Charisma, intellect, and vision are all important, but none as important as awareness. Great leaders must be aware of themselves, their followers, and their work. Taking time away from work can be difficult, but leaders must dedicate time to self-reflection and feedback. Being a collaborative leader means knowing yourself and others, giving and receiving feedback, and being culturally sensitive. Collaborative leaders build a sense of security and trust in their teams and allow everyone to contribute at their highest level. Leaders should set up formal and informal forums for feedback and to talk with the rest of the team. Understanding those around you will enable you to build empathy and trust, which are the foundation for effective team collaboration. As a collaborative leader, it is also important to be aware of cultural differences and be sensitive when navigating these differences. It is not always easy to know how to manage others, but communication and awareness are always a good start. Countries differ in how they prefer to give and receive feedback. Some countries are typically direct, using upgrading words to increase the severity of the feedback. Other countries are more indirect, using downgrading words to keep the feedback subtle. Americans are relatively direct in their feedback, but they wrap negative feedback in compliments to soften the blow. It is important to make employees feel valued, and to balance negative feedback with compliments over time. When an employee does a good job on an assignment, make sure they know you appreciate it. Building trust over time will help them accept your feedback when it is necessary to be negative. Make sure to prepare and practice what you are going to say when giving feedback. Focus on the person’s behavior rather than their personality, tell them before the problem develops and gets worse, and make sure to explain how fixing the problem will benefit both them and the team. Professionals in the Netherlands are also considered to be direct when giving negative feedback, but it is risky to try and match another culture’s directness. If employees have not built trust with you, then they could find your feedback to be insulting and they will likely disregard your suggestions. When crossing cultures, it is important to be courteous and consider the feelings of the person receiving the feedback. 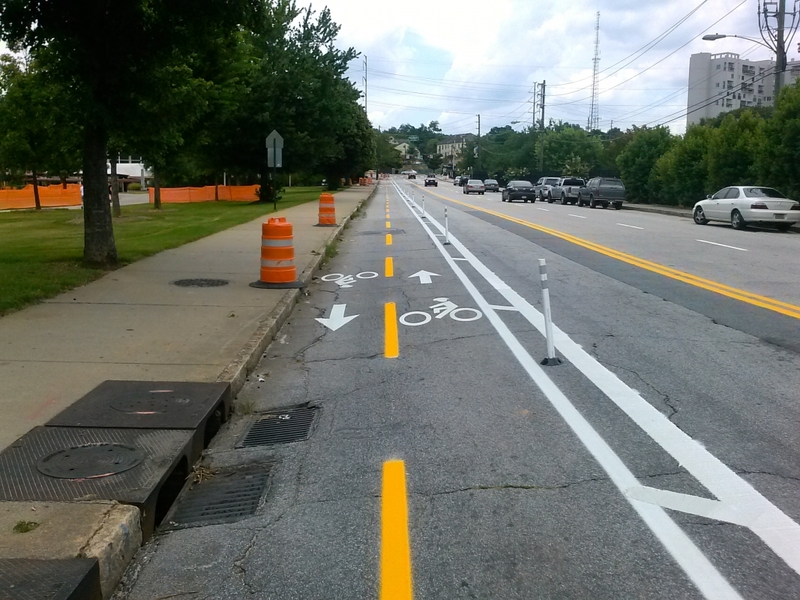 Biking infrastructure in Atlanta, even on the best corridors, still feels dangerous to an average cyclist. Automobile drivers tend to assume that bikers will not be on the road because they are rare, and so as a cyclist, you cannot assume that anyone will stop or yield when they are supposed to. Being in a large group fixes some of the problem, as cars notice the first bike and then the rest can follow safely. When passing through intersections or making left turns, cyclists must stop and check if drivers are prepared to stop. Bike lanes feel moderately safe, but when cars pass at speeds upwards of 35 miles per hour, the lanes feel narrow. 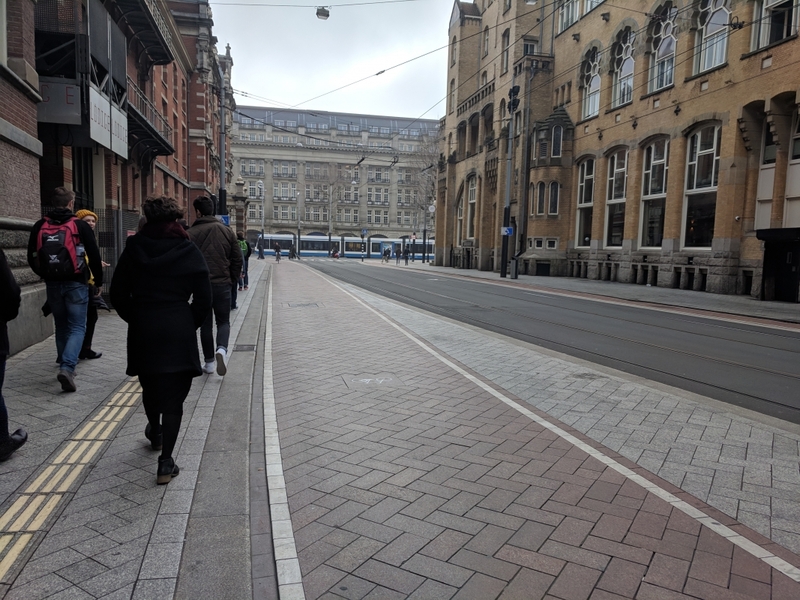 Cycle tracks separated by plastic posts, such as the one shown in the picture, feel slightly safer because of the space between cars and bikes. The cycle track would feel a lot safer with a sturdier divide, like a lane of parked cars or a row of concrete barriers. Cycling on neighborhood streets feel safer than cycle tracks despite having no biking infrastructure. The drastically reduced traffic speed helps to make bikers feel equal to drivers and allows for equal priority for all travelers. I would not feel safe biking on Atlanta roads by myself, regardless of where I was going. I was able to follow along with the group and navigate the planned route, but I would worry about making turns and findings safe travel lanes on my own. Even when streets have bike lanes or cycle tracks, they vary in terms of placement and are sparsely labeled. Additional signage or connections between paths and tracks would help a great deal when navigating new roads. The Dutch have done an incredible job of making cyclists a priority and building infrastructure to make biking safe and efficient. The train station at Delft is a great example of how much easier biking is in the Netherlands. Cyclists go down a ramp and into a large bike parking area in which bicycles can be secured at ground level or raised using a simple hydraulic system as shown. Connecting cycling with transit is an area in which America needs to dedicate more resources, as it allows people to travel long distances without the use of personal automobiles. 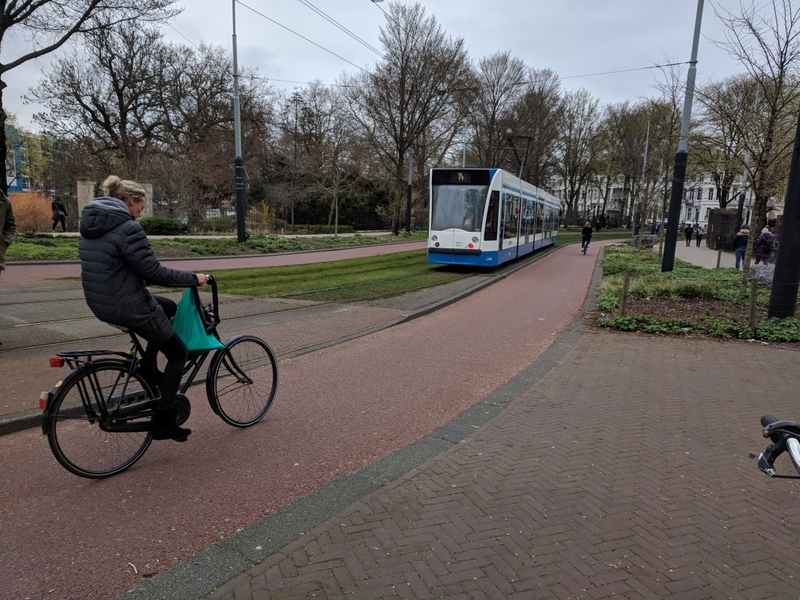 Intersections still present unique challenges for bike infrastructure, but the Dutch have created systems that allow for safe travel by all users. 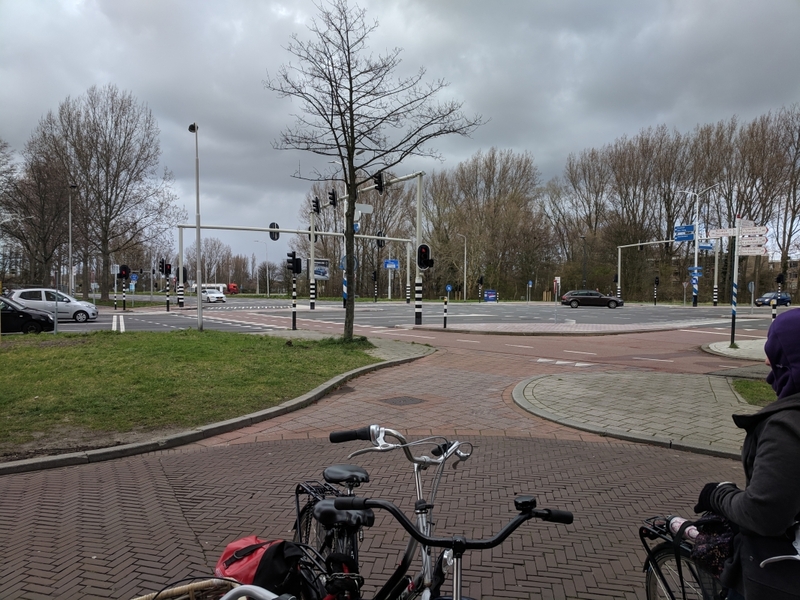 Use of roundabouts is prevalent, with cycle tracks going the whole way around and space for cars to stop and wait for bikes before and after crossing traffic lanes. When left turns are necessary, signals allow bikers to make the turn in two steps, with signals coming one right after another. Intersections in the U.S. seem to treat bikes like cars, mixing all travelers and allowing them to traverse the intersection together at their own peril. The Netherlands has made a cycling a priority because it was the will of the people. After World War II, cars became affordable and automobile traffic dominated the roads. Pollution and safety became a concern, and so protestors fought for increased cycling. The government dedicated time, money, and lane space to making biking safer and more efficient across all parts of the Netherlands. The Dutch do a great job of designing roads based on safe speeds for all vehicles and separating by types. They designate six modes of travel based on size and speed: walking, cycling, light motor vehicles, cars, buses and trucks, and track vehicles. Each has its own specific design challenges and requires different corridors. American infrastructure often combines all modes or separates into only two or three categories. Wagenbuur, M. [BicycleDutch]. (2013, June 9). Cycling in the US from a Dutch perspective. Wagenbuur, M. [BicycleDutch]. (2011, October 9). How the Dutch got their cycle paths. Wagenbuur, M. [BicycleDutch]. (2010, April 28). Bicycle Rush Hour Utrecht (Netherlands) III. Wagenbuur, M. [BicycleDutch]. (2014, February 23). Junction design in the Netherlands. Wagenbuur, M. [BicycleDutch]. (2015, June 1). Delft bicycle parking facility. My name is Ben Weishaar and I am a third-year undergraduate student pursuing a Civil Engineering major with a Global Engineering Leadership minor. I am from Germantown, Maryland, a large suburban town about an hour north of Washington, DC. Germantown is about a fifteen-minute drive from the end of the DC metro, so I took the train into the city often growing up. Local bus service was available around me, but most people traveled by car. I lived along the 270 spur off the DC beltway, so rush hour traffic was always a problem. Very few people biked for transportation, and most roads do not have any space for bikers to travel safely around cars. My travel to this point has been relatively limited. I took a trip to Italy with my family when I was 10, I went to Canada with friends when I was 18, I have traveled up and down I-95 from Boston to Jacksonville, and I have been to Chicago. The only aspect of transportation I remember from Italy was going up and down the hills of Tuscany on narrow, bumpy streets, in a stick shift van that my grandfather barely knew how to drive. My trip to Canada included planes, trains, and automobiles, but nothing struck me as innovative. I have been on trains in Boston, Chicago, and New York, all of which are far superior to the MARTA. Until now, I have never focused on transportation systems when traveling, but I am excited to learn from the Netherlands and their advanced biking systems. I have spent the past two summers working as an intern at a land development consulting firm in Germantown, and some of my work involved transportation planning and roadway section design. I presented options to clients based on lane use for driving, parking, biking, and walking, as well as space for trees and benches. Montgomery County Maryland recently passed a bicycle master plan, hoping to create safe travel for cyclists and reduce the number of vehicles on the road. Learning about how the Dutch use infrastructure to encourage safe and efficient biking will be incredibly useful for my future career. Many areas of the United States are pushing for sustainable transportation, and many Dutch techniques would be help create safer bicycle infrastructure here. I would like to continue my work in land development, and I want to be able to incorporate sustainable transportation solutions into future projects. I am also looking forward to spending time with industry professionals from the U.S. and the Netherlands. I would like to continue building my professional network and learn from the experiences of Professional Engineers in different areas.